Turn the clock back more than forty years to the last decade of steam operation on the network of CNR lines radiating out of Allandale, sixty miles north of Toronto and division point of the 672-mile Allandale Division . . . to an era before the automobile, the highway and the internal combustion engine dealt their mortal blows to traditional railway operations. Between these covers you will journey by mixed train through the scenic crannies of the Niagara Escarpment; stand trackside at Gravenhurst as Mikado locomotives change places on the head end of hot paper trains; travel by way freight through apple orchards to the sparkling waters of Georgian Bay; witness the Penetang mixed train winding through tall grass; study the servicing rituals being performed on steam engines coming and going from the 27-stall Allandale roundhouse; and stand on the station platform as number 41 rolls in behind a 6000-series Mountain Type. Through descriptive narrative and 248 stunning photographs, you will relive the excitement of the Allandale Division in its twilight. 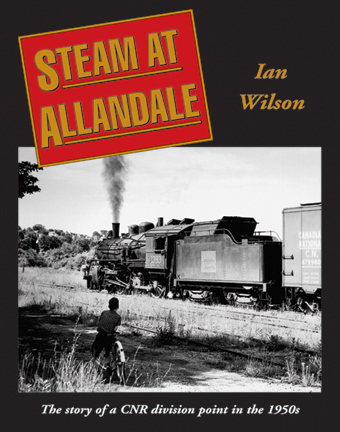 For aspiring modellers of the fascinating Allandale lines, track diagrams, timetables, steam locomotive assignments, and commentaries on train operations and industrial customers are provided.